John Boyd Dunlop was watching his son ride a bicycle when he noticed his discomfort when he rode over bumps. He wrapped the bicycles wheels in thin rubber sheets glued them together and then inflated them with a football pump. 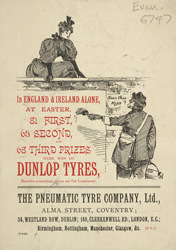 The pneumatic tyre was born! He patented the idea and within 10 years Dunlop’s tyre had entirely replaced solid tyres.